the shadows of people and laugh at their fright. Yellow A GENGAR is close by if you feel a sudden chill. It may be trying to lay a curse on you. a sudden chill, it is certain that a GENGAR appeared. prey's shadow and silently waits for an opportunity. heat. The chill it causes makes the victims shake. Ruby/Sapphire Sometimes, on a dark night, your shadow thrown by a streetlight will suddenly and startlingly overtake you. It is actually a GENGAR running past you, pretending to be your shadow. Emerald Deep in the night, your shadow cast by a streetlight may suddenly overtake you. It is actually a GENGAR running past you, pretending to be your shadow. FireRed It is said to emerge from darkness to steal the lives of those who become lost in mountains. Leaf Green On the night of a full moon, if shadows move on their own and laugh, it must be GENGAR�s doing. Diamond/Pearl Lurking in the shadowy corners of rooms, it awaits chances to steal its prey�s life force. 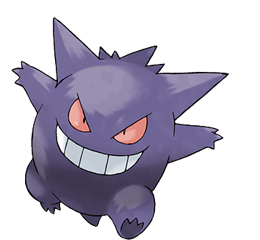 Platinum The leer that floats in darkness belongs to a GENGAR delighting in casting curses on people. Heart Gold It steals heat from its surroundings. If you feel a sudden chill, it is certain that a GENGAR appeared. Soul Silver To steal the life of its target, it slips into the prey�s shadow and silently waits for an opportunity. Black The leer that floats in darkness belongs to a Gengar delighting in casting curses on people. White The leer that floats in darkness belongs to a Gengar delighting in casting curses on people.